Mark Miller read Natural Sciences at the University of Cambridge, and continued there to study for a Ph.D. on the energy landscapes and dynamics of model clusters under the supervision of Prof. David Wales. Mark then undertook postdoctoral work in the group of Prof. William Reinhardt at the University of Washington in Seattle, and in the group of Prof. Daan Frenkel at the Institute for Atomic and Molecular Physics (AMOLF) in Amsterdam. Mark returned to Cambridge initially as a Junior Research Fellow at Churchill College, then as an EPSRC Advanced Research Fellow and finally as a University Lecturer. In 2013 he moved to the Department of Chemistry at the University of Durham. My research employs specially designed simulation techniques to investigate the structure, dynamics and thermodynamics of molecular and colloidal systems. A key element in my approach is the use of coarse-grained models that provide insight into a problem by being as simple as possible while retaining the essential chemistry and physics. Even with simplified models, it is often highly challenging to bridge the gap between the length- and time-scales associated with individual particles and those associated with collective properties. The development of simulation methodology is essential to make progress in such cases. Nature provides many examples of molecular building blocks that efficiently self-organise into well-defined structures, such as the cooperative folding and assembly of proteins into highly specific complexes, and the assembly of the protein shells (capsids) that encapsulate the genetic material of viruses. Such processes are driven by the shapes and interactions of the individual components of the final structure, and by the conditions in which they encounter one another. We are using modelling and simulation techniques to investigate the rules for, and limits of self assembly with the goal of learning how to design particles that will self-assemble into target structures with minimal intervention. Small aggregates of molecules or colloidal particles often have properties that differ from the bulk (very large samples). As well as being important in their own right, such finite systems can also be a useful forum for investigating how the interactions between particles lead to their collective behaviour. Two examples of work on clusters that we are currently considering are the formation of knotted structures formed in clusters of dipolar particles, and the stability of charged clusters relevant to electrospray processes. The characteristics of disordered phases can often be described by the nature of the aggregates that they contain. Aggregates may be compact or diffuse and may grow large enough to percolate (i.e., to span the entire system). For example, gels are low-density networks of particles that have become connected, possibly transiently, resulting in slower dynamic relaxation of the structure. In systems of electrically conducting particles there is a sharp increase in the conductivity of the entire sample under conditions where the particles connect into a percolating network. Finner, Shari P., Kotsev, Mihail I., Miller, Mark A. & van der Schoot, Paul (2018). Continuum percolation of polydisperse rods in quadrupole fields: Theory and simulations. The Journal of Chemical Physics 148(3): 034903. Madge, Jim, Bourne, David & Miller, Mark A. (2018). Controlling Fragment Competition on Pathways to Addressable Self-Assembly. The Journal of Physical Chemistry B 122(42): 9815-9825. Law, Jack O., Wong, Alex G., Kusumaatmaja, Halim & Miller, Mark A. (2018). Nucleation on a sphere: the roles of curvature, confinement and ensemble. Molecular Physics 116(21-22): 3008-3019. Madge, Jim & Miller, Mark A. (2017). Optimising Minimal Building Blocks for Addressable Self-Assembly. Soft Matter 13(42): 7780-7792. Horner, Kate E., Miller, Mark A., Steed, Jonathan W. & Sutcliffe, Paul M. (2016). Knot theory in modern chemistry. Chemical Society Reviews 45(23): 6432-6448. Castilla, A. M., Miller, M. A., Nitschke, J. R. & Smulders, M. M. J. (2016). Quantification of Stereochemical Communication in Metal–Organic Assemblies. Angewandte Chemie International Edition 55(36): 10616-10620. Madge, Jim & Miller, Mark A. (2015). Design strategies for self-assembly of discrete targets. The Journal of Chemical Physics 143(4): 044905. Miller, Mark A., Bonhommeau, David A., Moerland, Christian P., Gray, Sarah J. & Gaigeot, Marie-Pierre (2015). 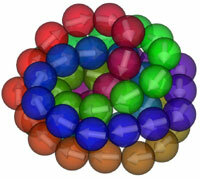 Dynamics and thermodynamics of decay in charged clusters. Molecular Physics 113(17-18): 2428-2434. Schilling, Tanja, Miller, Mark A. & van der Schoot, Paul (2015). 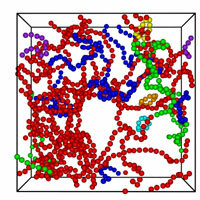 Percolation in suspensions of hard nanoparticles: From spheres to needles. EPL (Europhysics Letters) 111(5): 56004.